And if it takes a while for banks and lenders to get up and running again, what’s the big deal? Saving and investment are themselves not essential to the economy in the short term. Businesses could postpone their investments for a few quarters with a fairly small effect on Americans’ living standards. How harmful would it be to wait nine more months for a new car or an addition to your house? Also, this post on the Environemental Economics blog points out that the stock market has given a handsome return over the last 60 years even after the recent turmoil. So, cheer up, folks! As most recurring news event, the crisis has started to bore me. I cannot help but bring attention to Joseph Stiglitz latest comment on the bailout still, published at the Economists’ Voice. One reason I think Stiglitz’ views are interesting is that he argues how I did myself in a recent conversation: The bailout does not address the fundamental problem; all the bad loans. Instead, a rescue operation should help homeowners in trouble. According to Stiglitz, this could be done rather quickly and the measures he proposes would be a lot cheaper than bailing out Wall Street. Earlier I wrote about the problem the managers of the bailout funds will face valuating the rotten assets, and a possible solution. As Stiglitz points out, paying a fair price for the bad loans will not fill the hole in the banks’ balance sheets. The solution of a decentralized bailout, thus, is clever, but it would work oposite to the overall goal with the bailout. 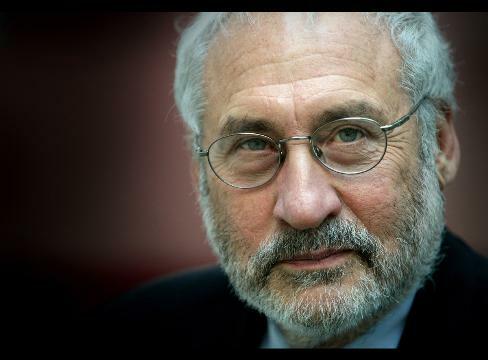 Stiglitz concludes that the American taxpayer will in all likelihood have to suffer. He goes on to ponder what only some of the bailout money could do; health care for children for example. Over on the Environmental Economics blog someone commented on what a billion dollars to each of 700 American universities could do to the education sector. In conclusion, Stiglitz does note think the (just voted through Congress) bailout is sufficient. It annoys, then, that he still think it makes sense to go ahead with the bailout. I beg to differ. It [Congress’ failure to ratify the bailout plan] is understandable because the use of taxpayer money to buy so-called “toxic” mortgage-backed securities from the greedy fools who created the crisis is hard to tolerate. It is also understandable – even creditable – that those Republicans hostile to “socialism” do not want to bail out the undeserving rich, at least before an election. It is understandable, too, because, for reasons I put forward last week, the plan is not convincing. It is designed to deal with a problem of illiquidity in what seems certain to be a growing crisis of insolvency, particularly as house prices fall and the economy continues to weaken. Yet the rejection is grossly mistaken because the resulting ruin will hurt the weak and destroy the legitimacy of the market economy. The plan is indeed flawed. But failure to ratify it is unlikely to convince anybody that something better will be forthcoming. It will convince them [who? ], instead, that the US is choosing to be impotent. At a time of such fragility, when the insurance offered by government is most indispensable, this is the worst possible message. It is a pity Mr Paulson did not choose another plan. It is a pity, too, that a former titan of high finance was charged with bailing out Wall Street. Yet it was still a mistake to reject the plan. It was necessary, instead, to build upon it. Government must start to show it is in control of events. In the twilight of a failed US administration, that may seem far too much to ask. Winston Churchill, Roosevelt’s partner, said: “The United States invariably does the right thing, after having exhausted every other alternative.” The alternatives are now exhausted. It is time for politicians to do the right thing. I found the caricature that accompanied the article funny and to the point. It remains to see whether it is water or gasoline he has in the pipes. Posted in Economics | Comments Off on Time to act? I am not a regular on the Freakonomics* blog, but I surf by every now and then. Nowadays the financial crisis in the US and Europe is of course in focus. This piece by Erik Hurst has an interesting discussion of why a vibrant banking sector is necessary and a review of the history of bank regulations in the US. He pinpoints that earlier deregulations reduced interest rates and gave more people access to credit. The demands for more regulation that has surfaced during the current crisis concerns Hurst as he is afraid that the (social) costs these regulations may impose would not get the appropriate attention. On my part, I wonder what kind of regulations people have in mind. Laws against subprime lending? I think that would lead to overly complicated regulations impossible to enforce. But somehow putting a ceiling on the risks a bank is permitted to take do make sense. As the government insure deposits there is risk of moral hazard. Suppose that the economy has illiquid mortgage assets with a face value of $1,000 billion, and that the Treasury believes that the introduction of buyers armed with $100 billion could bring the necessary liquidity to this market. The Treasury could divide the $100 billion into, say, 20 funds of $5 billion and place each fund under a manager verified to have no conflicting interests. Each manager could be promised a fee equal to, say, 5 percent of the profit its fund generates — that is, the excess of the fund’s final value down the road over the $5 billion of initial investment. The competition among these 20 funds would prevent the price paid for the mortgage assets from falling below fair value, and the fund managers’ profit incentives would prevent the price from exceeding fair value. * Freakonomics is a blog based on the same ideas as the book by the same name (that is, a blog developed from a book, oposit to the recent trend of books based on popular blogs). The book is a demonstration of both the power of microeconomic theory (combined with statistics) and the talent of Steven D. Levitt. I recommend the book to anyone sligthly interested (in economics, or, more extraordinary, Levitt himself for that matter) or just generally curious. The […] problem is that the bailout reveals that free markets don’t really work well, at least in the sense that free markets won’t lead to an avoidance of booms and busts. If unregulated free markets don’t really work in the one place where they might, finance, then how are they expected to work well to solve environmental problems and allocate health care efficiently? My opinion is that financial, environmental and health care markets can be nudged toward efficiency with a little bit of regulation. Of course, such a statement stirs discussion; the comment section to the post is quite interesting and even funny. John Whitehead is a professor of economics at the Appalachian State University. He is also one of the people behind the Environmental Economics blog.